This weekend I made my first attempt at cake pops. No, I don’t have a special event that I’m making them for, I just think they are so cute and fun! I started out with the intention of making them cake pops (on a stick), however, due to some “technical difficulties”, they became cake balls. 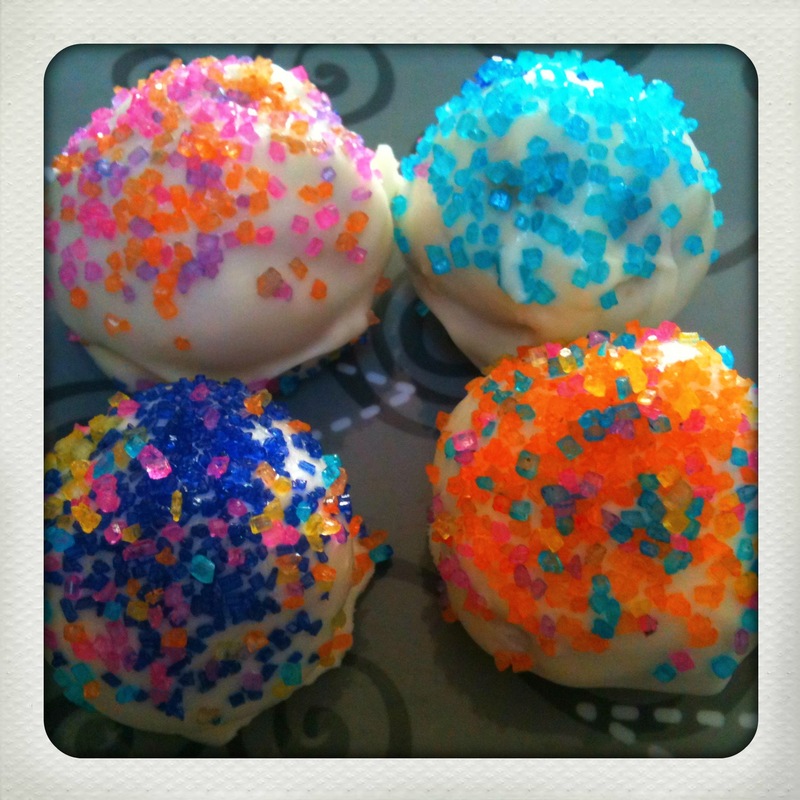 I say “technical” difficulties, because it would be pretty hard to screw up cake balls, flavor-wise. You just can’t go wrong with a bunch of cake crumbs, a lump of frosting and some melted chocolate, no matter WHAT form it’s in, right? My issues were merely with presentation. 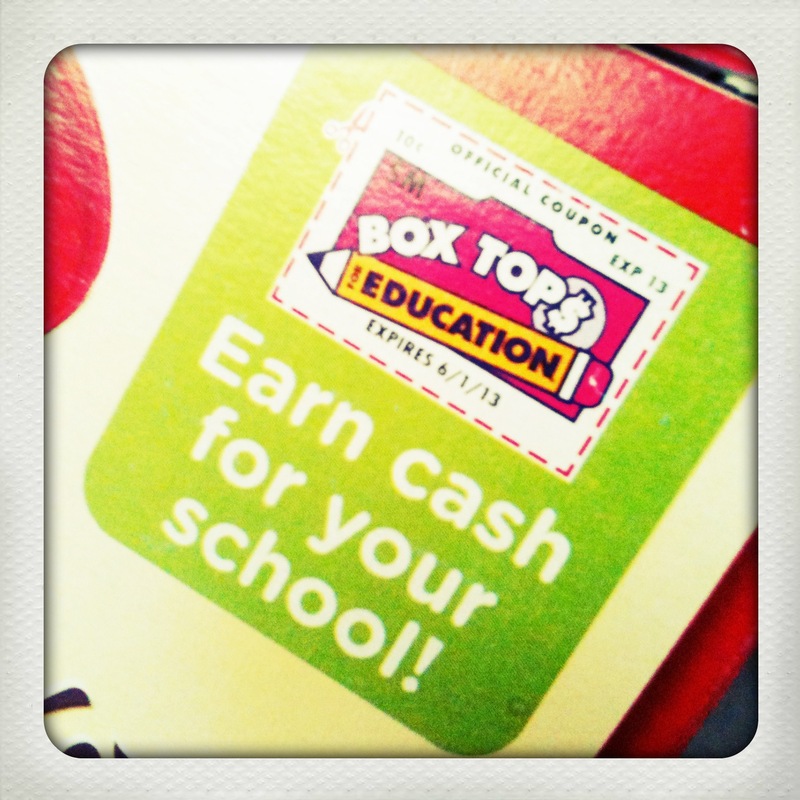 Don’t forget to clip your box top for education if your cake mix has one! Let the cake cool COMPLETELY. Once it’s cool, crumble the whole cake finely, into a bowl. This is a great job for kids if you have them baking with you. Emma did this and LOVED it! 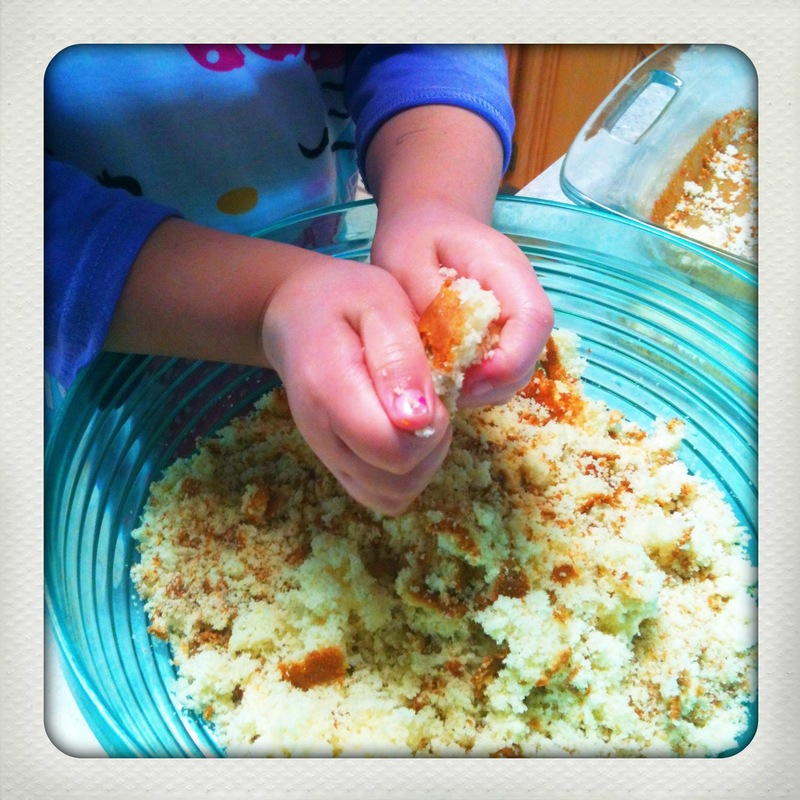 Once you have the whole cake crumbled, empty the entire can of frosting into the crumbles. 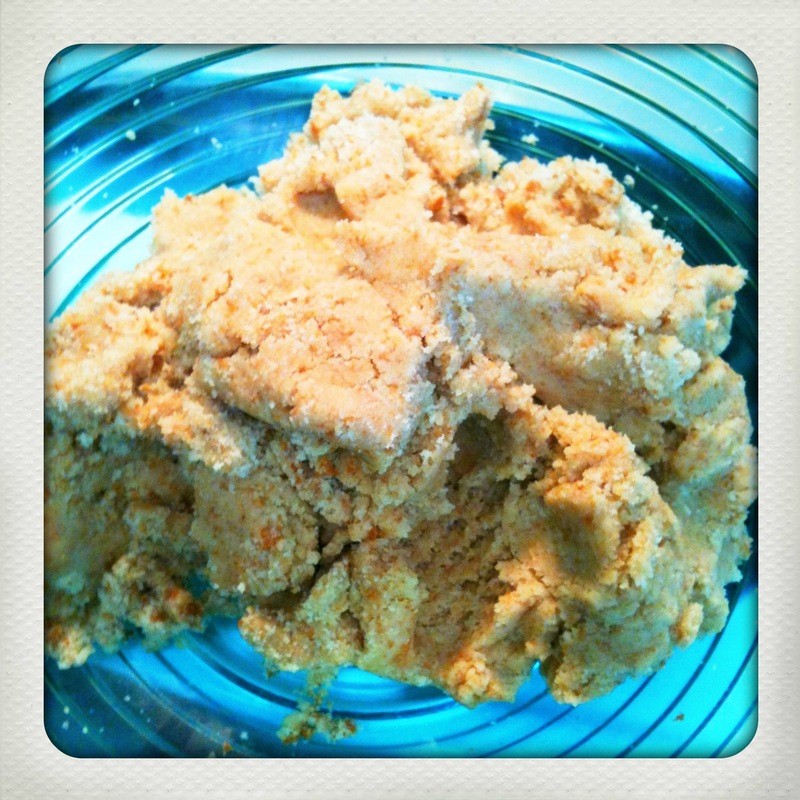 Mix together well, until it forms kind of a dough consistency. It’s easiest and fastest to do this with your hands (kind of like mixing meat-loaf). 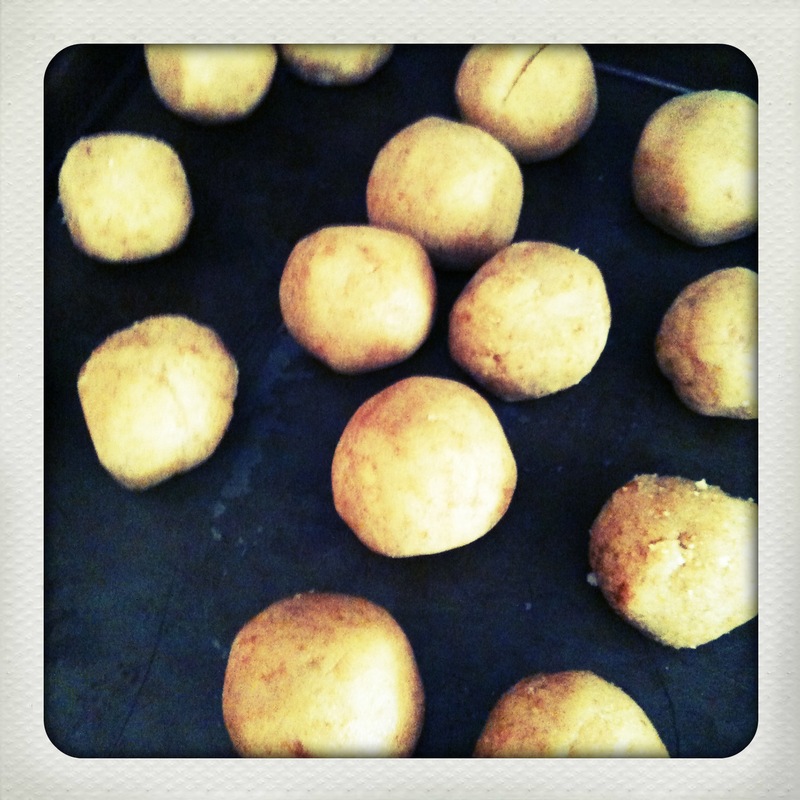 Once your “dough” is ready, you can roll it into quarter sized balls. Then, refrigerate your balls (HAHAHA…oh, sorry..) for a couple of hours. They need to be cool to work with them in the chocolate. 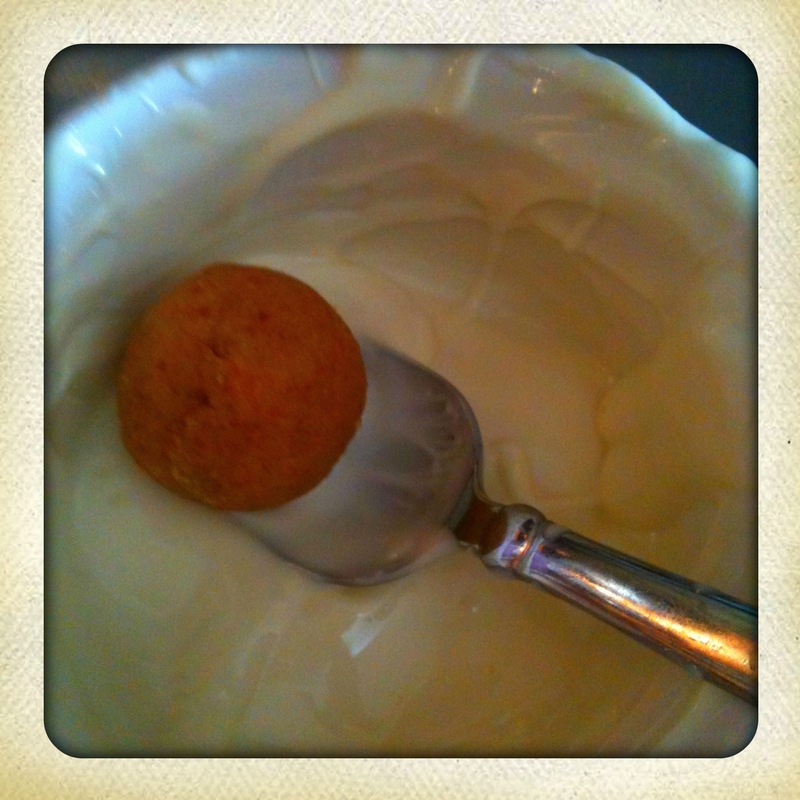 Here is where my first modification comes in…going from cake pop, to cake ball. I could not get the balls to stay on the sticks. They slid off. There must be some secret to making them stay on, but I don’t know that secret yet. Also, I cannot figure out how you get the melted chocolate (next step) from just running down the stick, and off of the cake ball. I was not going to dedicate 10 minutes of turning into EACH ball…noooo way. I do not have that kind of patience! Once they are cool, melt your chocolate wafers in the microwave, according to instructions on the package. 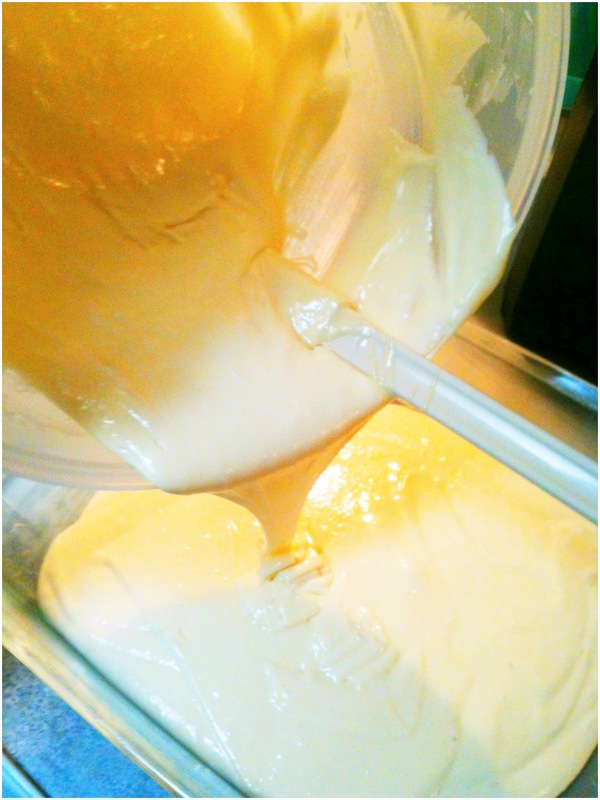 It’s best if you melt small quantities at once, as it will harden back up as it cools. Here is where my second modification comes in. I wanted bright vivid colored cake pops, so after my first bowl of wafers was melted, I squirted in a shot of gel food coloring. This was a BAD idea. The chocolate seized IMMEDIATELY. And I really do mean, IMMEDIATELY. If you don’t know what seized chocolate is like, think CEMENT. So apparently gel food coloring = bad news with melted chocolate. Crap. Ok, moving on. I poured more wafers into another bowl and melted them. This time I try good ole fashioned liquid food coloring. SEIZE. Again. AAAHHHHH. Now I am REALLY frustrated. How the he** do I get this chocolate COLORED? Is it really THIS hard? Clearly there is a secret to this as well that has eluded my vast (NOT) knowledge of using melted chocolate. Yeah, I know they make those wafers in colors, but I wanted BRIGHT colors, not pastels, which is all I seem to be able to find. Here is a little example of the chocolate cement….in the picture below, I am holding ONLY the spoon up, the chocolate (cement), is what’s holding everything else together. 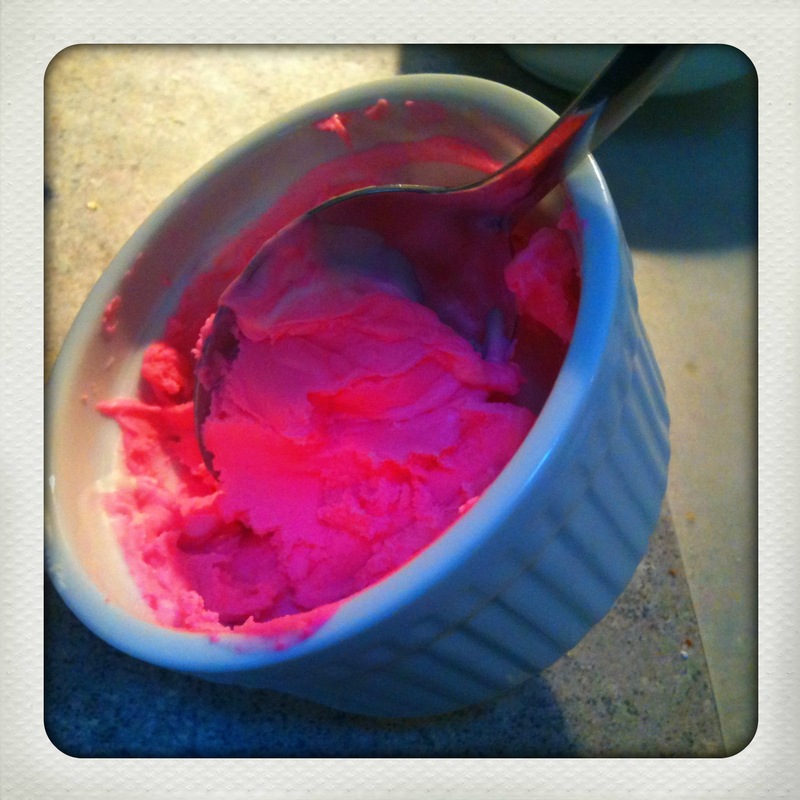 I could have picked the whole bowl up off the counter with the spoon. Nooooo bueno! 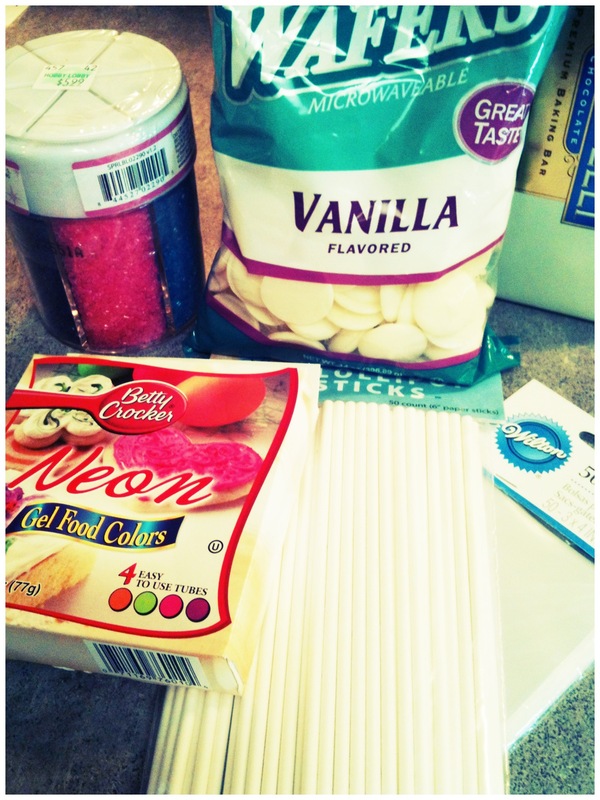 Ok, FINE…..Plan B. I’ll go with WHITE chocolate, and just sprinkle the dang colors on. So I melted my THIRD bowl of chocolate wafers. 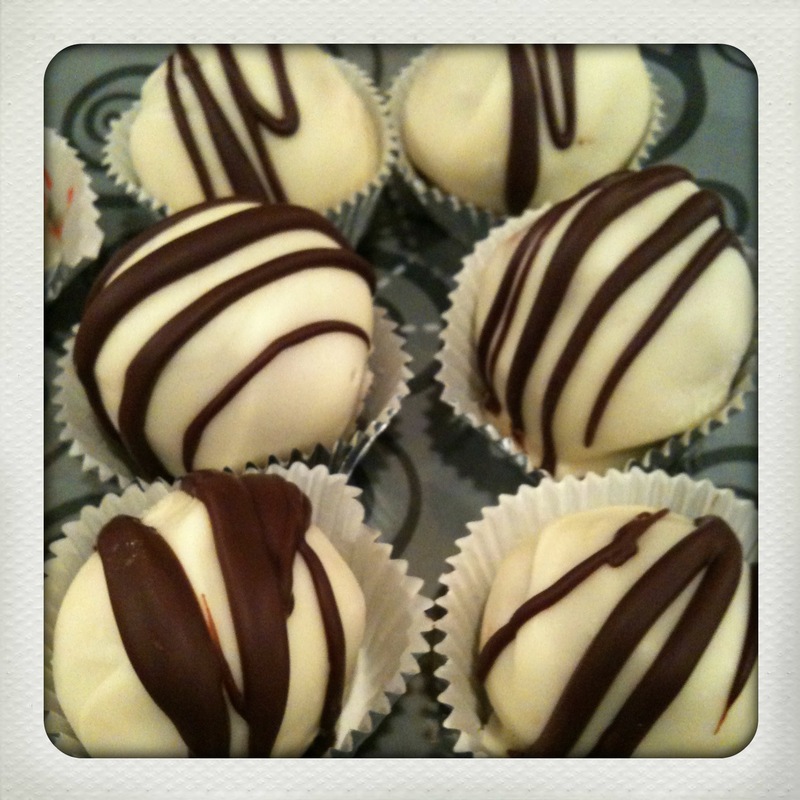 And proceeded to roll my cake balls around in the chocolate using a spoon, making sure to get a nice thick coating on. I laid them on parchment paper on a cookie sheet to set. Emma sprinkled them for me. 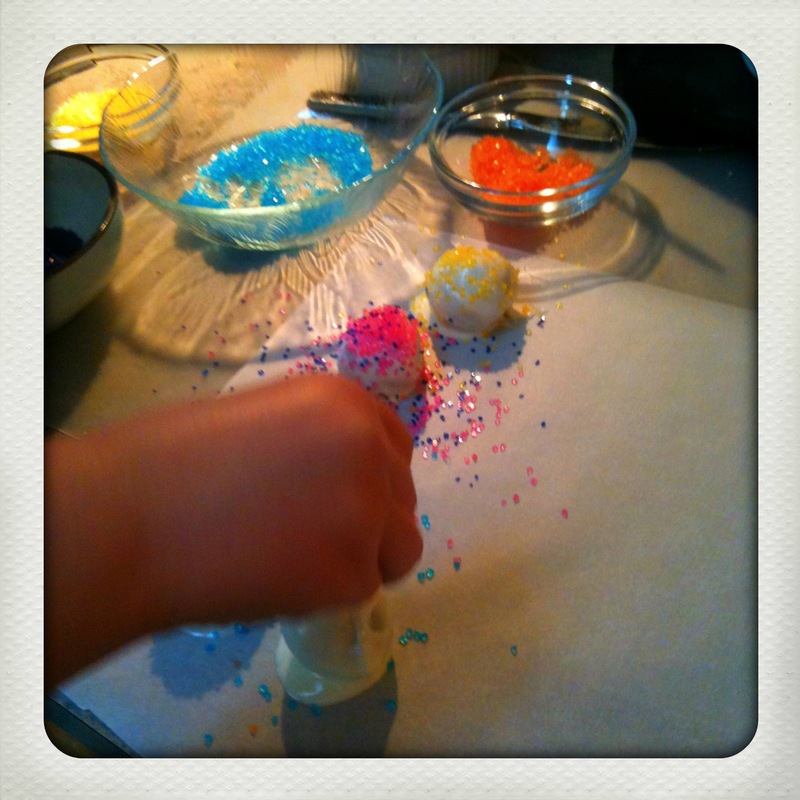 So hopefully you can learn from some of my mistakes if you decided to tackle cake pops/balls. Good luck! Kelly, seriously, I have GOT to stop reading these at the gym. I will immediately clutch your rss feed as I can not to find your e-mail subscription hyperlink or newsletter service. Do you have any? Please let me recognise in order that I may subscribe. Thanks. You can follow my blog by clicking on the “Follow” link from the menu on the left side of the blog page. Thanks!